Hello friends! 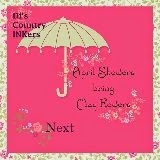 Welcome to another edition of Di's Country INKers blog hop! Can't believe it is already April 1st-that is no joke! This year is going by fast. If you are just stopping by, you just finished visiting Barb's Blog, wasn't her project super cute! And did you see our cute blog buttons for this month's theme? Adorable. No need to guess what our theme is this month. So for my project today, I once again created a simple card, seems to my MO lately. But sometimes simple is good. The stamp set is Love is Kindness from the Occasions Catalog. I finally inked it up, this was a stamp set we got at Spring Fling back in February, but I was unable to attend because I was sick. I will definitely be inking it up more. Up next is Crystal. Can't wait to see what beautiful project she has in store for us. If you get lost, don't worry, below are all the links to everyone's blogs. Please show them some blog love and leave them some nice comments. Thanks for stopping by today! Until next time. Again...great minds. Love that you embossed it!!! Love the embossing on vellum and the simplicity of your card - well done! !